This week we cross the one month mark of living full-time in an RV. We’ve put close to 4,000 miles on the RV, seen amazing waterfalls and eaten our fair share of nachos. I can’t believe it’s already been a month, yet it’s hard to believe it’s only been a month. 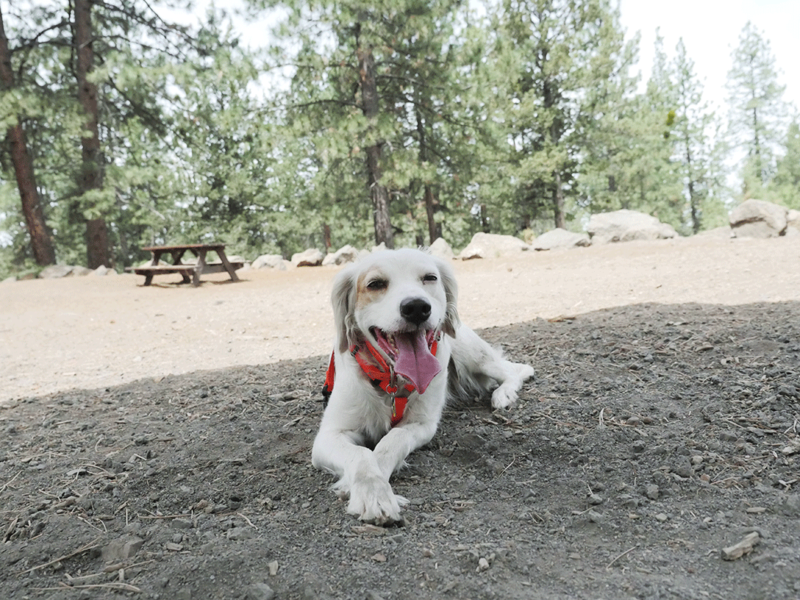 This past week we were finishing up some errands and heading back to the RV. Not even thinking about it I said something to the effect of when we get home, let’s walk the dogs… blah…blah…blah. 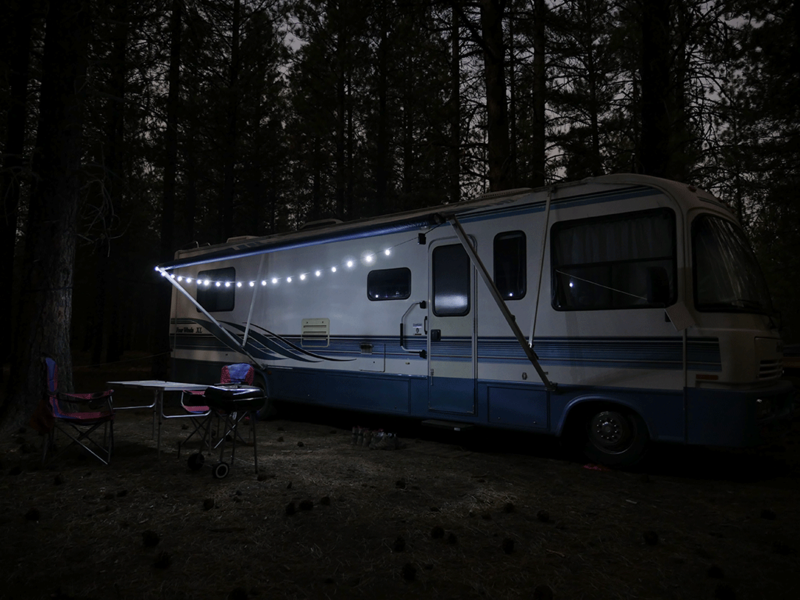 Then it hit me – it was the first time we referred to the RV as “home” and not just the “RV.” Call me sentimental but we’ve made this RV feel like home no matter where it’s parked. 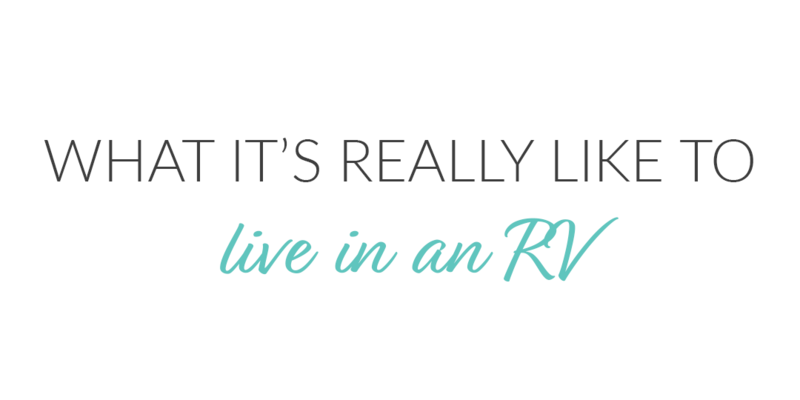 So what is it really like to live in an RV? It’s pretty freaking great! To be fair, there is a difference, I assume, between traveling full-time while in an RV and being stationary. Exploring new places definitely enhances the RV lifestyle. But in either case, the “tiny house” life is simply good. Everything we need fits in this tiny space plus a few things I thought I needed – like 8, maybe 9, pairs of shoes. I minimalized the best I could before the trip, ok. Going from a 1,700 square feet house to 32 feet of RV means space is sacred. Everything has a home from the dishes to clothes to shampoo. Unlike in our house, things have to go back to where they belong or it starts to feel cluttered fast. This includes dishes. Man, do I miss a dishwasher. For the most part we cook all three meals, so we do dishes three times a day. When the sink is too small to hold a day’s worth of dirty dishes and you don’t have extra pans or plates, it’s kind of a necessity. Speaking of cleaning, full-time RV living with three dogs means tumbleweeds of dog hair form in seconds. These snuggly, slobbering, shedding puppers make this road trip so much fun but leave a trail of fur behind them. Cue the mini vacuum cleaning, broom, lent roller and furminator. I’ve bumped into the dinette, the dogs, Luke, the drawer pull, the couch, the shoes I didn’t put up immediately. It’s just how life in the RV goes. I’m not sure if after a month of RV living I’m getting better at not bumping into things or if I just don’t notice anymore. Thankfully, we spend most of the day outside. In fact, I’m outside the RV at our little camping table right now. 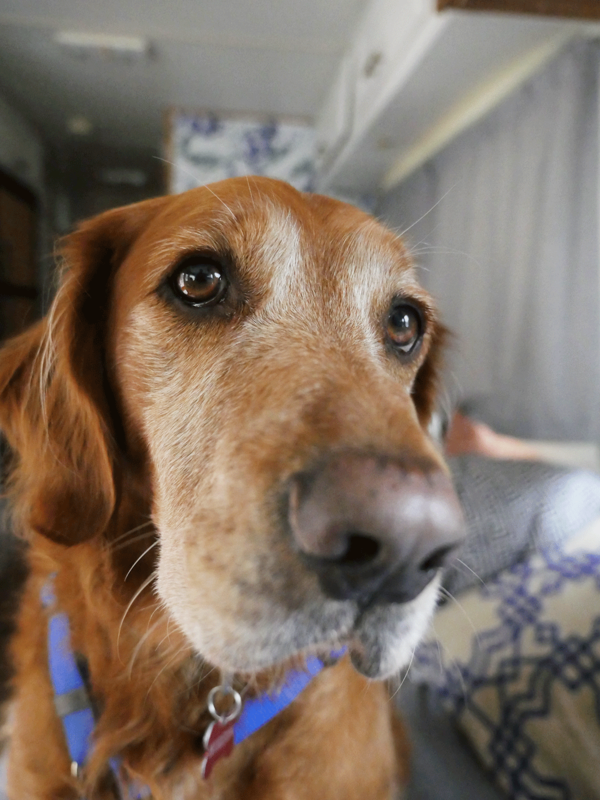 When we are inside the RV hanging out, we usually sit at the dinette and let the dogs share the couch, so it never really feels crammed. 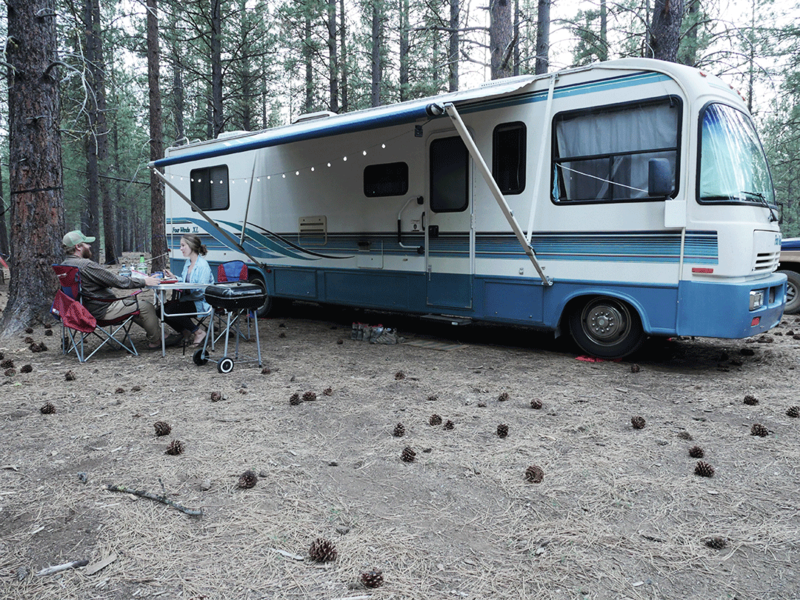 Full-time RV living and traveling has offered us a totally different pace of life. When we decided to embark on this adventure, it meant mixing up careers and income sources, which was probably the hardest part for me. There’s no doubt working from the road presents some challenges. But we set our own pace and for the most part have the freedom to make our own schedules. We’ve slept in, cooked real breakfast together, taken the dogs to the dog park, worked from the dog park, explored in the afternoon, worked a little more, cooked dinner, stayed up late sitting outside – all on Monday. It’s nothing like our normal Mondays. When planning our trip, we decided we would dry camp as much as possible. That means we are not staying at RV parks; therefore, no electric or water hook-ups. For the most part, we’ve stayed at National Forest land, literally in the forest. It’s great because we have room to spread out our outdoor living room, hang the hammocks and let the dogs chill outside. While I am 100% for dry camping, it has a few challenges like a limited supply of water and electricity. We leave the campsite to refill the water tanks about once a week when we run out, and while it’s not a huge hassle, it does take time. I thought before moving into the RV that I was good at not wasting water, but when you know you have a limited supply, it’s a whole new game. To conserve water while dry camping in the RV, we bought a new shower head that has a setting to reduce water flow so you don’t have to turn the water on and off while showering. We’ve also gotten our dish washing process down and paid more attention to the amount of water used when brushing our teeth and normal day-to-day uses. We knew when we decided to dry camp, we needed a power source besides the generator. Solar seemed to be our best option. 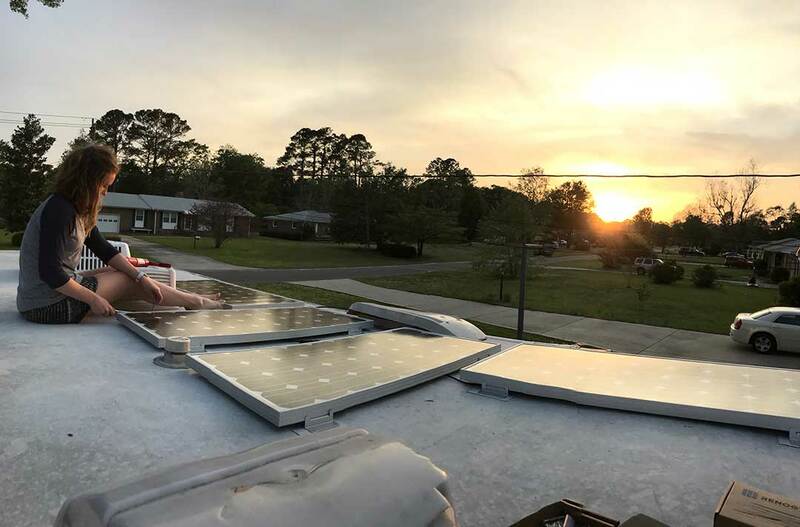 After much research, Luke with a little bit of help from me installed 4 Renogy solar panels and a battery bank for the RV. With the solar, we able to charge our phones and computers, run the microwave, coffee grinder and TV (even though we’ve only used it a handful of times) and the lights. There have been a few cloudy days that haven’t provided a good charge, so we switch over to lanterns and avoid using the microwave, TV, etc. You can’t really complain about dinner by lantern, anyways. 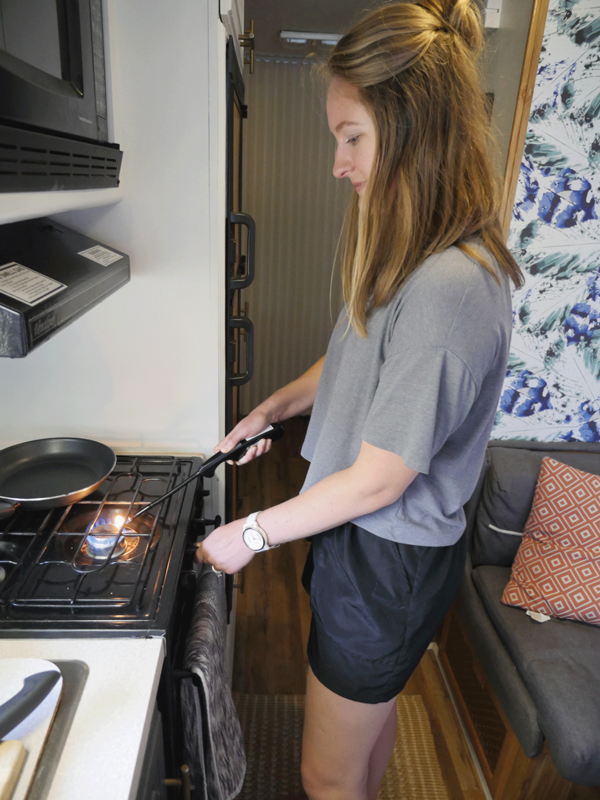 It’s fair to say RV living is vastly different than our former day-to-day life. It has it’s unique challenges but the rewards are so worth it. I get to spend every day exploring with my best friend, experience places for longer than a vacation would allow and get to take the pups on an adventure of a lifetime – which I know they appreciate. Thank ya, thank ya! I can’t wait to hear about your new adventures, too!! What an awesome time in your life! So glad you can experience something most people don’t. Keep enjoying the “slow” life. Thanks! We figured it was a now or never trip! How exciting! Thanks for sharing and we can’t wait to read more! Thanks! I miss you guys!! What a great opportunity for you guys! I love reading your blog. Safe travels and God bless! Yep. Yep. Yep. 😊 We have been full time on the road for 6 months! Life changing, wonderful decision we all made!! It definitely is life changing! What’s been your favorite place? Love this so much! This is exactly why we decided to uproot our normal lives and give this lifestyle a shot! We just bought a new 32.5’ motorhome and will be heading out Jan 2017 with our two dogs and my soon to be wife! So cool finding other younger couples embracing an alternate lifestyle in an RV! Awesome! You’re going to love it. We can’t wait to follow along with your adventures on Instagram!